Guinness World Records recognizes mammoth Tel Aviv event by White City Shabbat as the biggest in recorded history. 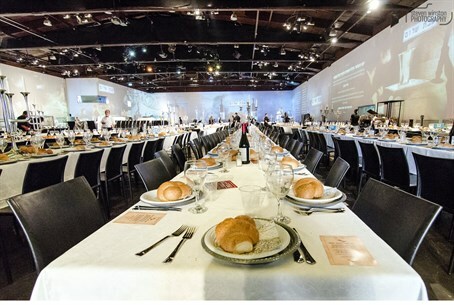 On Friday night, White City Shabbat set the Guinness World Record for the Largest Shabbat Dinner ever at the Hangar 11 in the port of Tel Aviv. 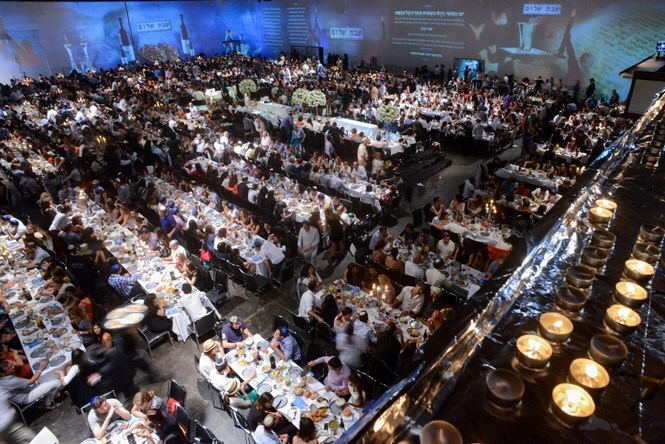 2,226 attendees were officially inscribed in the Guinness World Record for the Largest Shabbat Dinner, with notable diners including Chief Rabbi of Tel Aviv, Rabbi Yisrael Meir Lau; Professor Alan Dershowitz; Ambassador Michael Oren; Israeli basketball legend Tal Brody; Canadian MP Irwin Cotler; MK Elazar Stern, and Mayor of Tel Aviv-Yafo, Ron Huldai. Making the Guinness World Record Largest Shabbat Dinner happen took almost a year of preparation, 60 days of crowdsourced fundraising, 800 bottles of wine, 80 bottles of vodka, 50 bottles of whiskey, 2,000 challah rolls, 80 long tables, 1,800 pieces of chicken, 1,000 pieces of beef, 250 vegetarian portions, 2,300 diners signed up and another 3,000 on the waiting list. In addition to organizing a dinner for over 2,000 people, White City Shabbat also had to obey the laws of kashrut, Shabbat and of course, those of Guinness World Records. GWR stipulated that all attendees must be seated and have their first course served by the waiters all within five minutes, and thereafter must remain at the table for the full hour that it takes to eat the traditional shabbat meal. Table captains were appointed to report to Patel and verify that everyone adhered to the rules. It was also important for the Guinness judge to know that the meal adhered to traditional Jewish customs for Shabbat, including the proper prayers and blessings over wine and bread, and that the organizers weren’t breaking any religious laws. The evening began with short speeches from Rabbi Lau, Dershowitz, Cotler and Jay Shultz, President of Am Yisrael Foundation, White City Shabbat’s umbrella organization. They were followed by a giant Kabbalat Shabbat prayer service outside of the Hangar. Once the meal was underway, organizers controlled the crowd by holding up large signs at strategic times throughout the meal, including “Shalom Alechem”, “Stand up”, “Sit down”. The words to many of the key prayers were projected on the inside walls of the venue. After the Golan Heights Winery sponsored Kiddush, Jay Shultz stood on a stage in the center of the room, hoisted a two-meter long challah above his head and roared out the Hamotzi blessing which marked the official start of the meal and triggered Patel’s stopwatch. 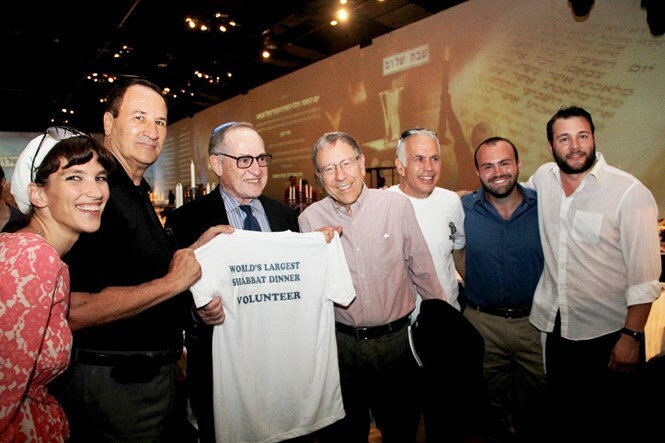 Various organizations, families, synagogues, and groups of visiting tourists had booked tables in advance so they could sit together including, Nefesh b’Nefesh Lone Soldiers, Hillel Latin America, Sackler Medical School and the Israel Lacrosse team. A range of strategic partners were also involved, including the Municipality of Tel Aviv-Yafo, the Israeli Ministry of Religious Services, ROI Community and Chabad on Campus who sent a group of young rabbis to help guide the crowd. White City Shabbat is a volunteer-run non-profit organization that acts as the portal for Jewish life in Tel Aviv. The organization serves as a matchmaker for Shabbat hospitality, connecting guests with hosts throughout the city each week in addition to hosting large young professional communal dinners each month, holiday celebrations, a Jewish learning series, beginners learning minyan, and inter-community programming.